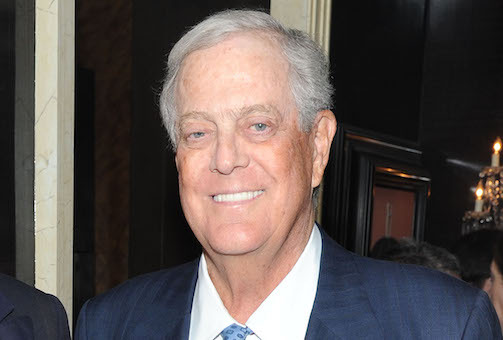 Koch, the vice president of Koch Industries and the world’s sixth wealthiest person, is a deep-pocketed donor to Republican and conservative groups. "I believe in gay marriage," he told Politico in 2012. A former vice presidential candidate on the Libertarian Party ticket, Koch is in line with that movement’s thinking on the issue, despite his support for a party that frequently opposes gay marriage. "I think the Republican Party has a great chance of being successful and that’s why I support it … but I believe in the libertarian principles," he told Politico. The brief’s signatories include former Republican National Committee chairman Ken Mehlman, conservative pundits S.E. Cupp and Alex Castellanos, former White House chief of staff Ken Duberstein, former Mitt Romney senior advisers Beth Myers and Carl Forti, conservative economists Doug Holtz-Eakin (formerly director of the Congressional Budget Office) and Greg Mankiw (formerly on the Council of Economic Advisers), former senator Alan Simpson (R-Wyo. ), former homeland security adviser Fran Townsend and former Massachusetts state Senate minority leader Richard Tisei. The presence of an esteemed general suggests that there is no segment of society in which gay marriage is not gaining acceptance. There are on the list centrist Republicans, more libertarian figures and even social conservatives. In a phone interview Mehlman said, "I think the diversity of the people is a reflection of what we have seen which is increased support in every demographic [for gay marriage]."